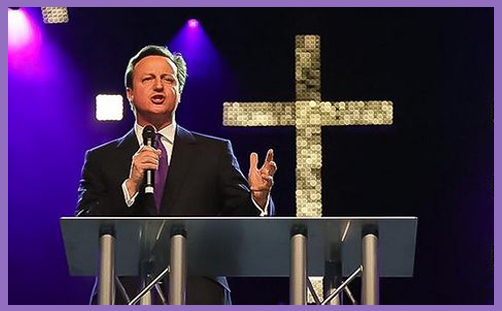 David Cameron did a lot of God yesterday. If you judge by the Daily Mail photo splash, it was mainly about Sikhs, gurdwaras and Vaisakhi. But he also addressed the Festival of Life – the largest gathering of Christians in the UK, organised by the Redeemed Christian Church of God (RCCG) – where he spoke about aspiration, ambition and the Big Society (and got prayed for). I have to say, I don’t envy the organisers of tonight. It must be like the feeding of the 5,000, except – I can see you – you are 45,000! You must be relieved that it’s just spiritual food on the menu tonight. ..Together we are all part of one family. As Jesus said with his arms outstretched to his disciples, “Here are my mother and my brothers, for whoever does the will of my Father in heaven is my brother, my sister and my mother.” And that is what we are, as God’s children, we are all one big family. Now when I was a child, I had a very specific image of what a church was. I thought to be a church, it had to be an old, grey building with a slate roof and a big spire, and it had to have pews and a pulpit, and a graveyard where the naughty boys would play hide and seek. But I was wrong, and you prove that. You’ve proved that church is people; church is a family. And it doesn’t matter what the roof is made of, because with your energy, your devotion, your love of Jesus Christ, you raise that roof every time. Now your dedication to family – your family is blood, and your family is humanity – it goes way beyond this room. I think of how many ways you love your neighbour: with care for those who are sick and lonely; with mentoring for teenagers who think they have no hope; with fundraising for hospices, for looked-after children, for those suffering unimaginable trauma overseas. And like Jesus turning water into wine, you turn loneliness into companionship; you turn deprivation into comfort; you turn lost lives into lives with purpose. For years I have tried to explain to people what the Big Society is. Some people were determined not to understand it. Well, I should have brought them here to the Festival of Life, because this is the Big Society in action, and it’s as vibrant, as alive and as powerful as ever. Now just think how great our country, Britain, could be if we built on that; if we had an even bigger Big Society, where even more people shared your family values – values of prudence, of hard work, of looking out for those who fall on hard times. With these values we can achieve the Britain we all want to live in – where the oppressed are cared for; where the lonely are befriended; where it’s not where you come from but the content of your character that really matters. And tonight, let us be proud that this is a Christian country, where we stand for the freedom to practise your faith, and where we stand up for Christians and all those who are persecuted anywhere in our world. They are family, too..
It’s certainly no Sermon on the Mound, but nor is it an entirely vacuous theology (or, indeed, ecclesiology). Assuming he means what he preaches (a doubt never present for one minute with Margaret Thatcher’s sermonising), David Cameron espouses an understanding of the universal Church which is rooted in God’s redeemed people, gathered together to worship, praise, pray and serve. The Church is not a material building because wood, bricks and glass can’t be greeted, vexed or persecuted, as St Luke records in the Book of Acts. For David Cameron, the Church is those who are called out of every kindred, tongue, people and nation to do the will of God. The worship is not simply upwards to glorify, but outwards to serve. As the Church gathers, it ministers in love, one saint to the other, but also to sinners, demonstrating salvation to a lost and dying world. The Prime Minister’s theological priority is not obedience to commandments or the meeting of certain moral standards, but to do good and love one another, which is the basic principle of Christian ethics. The law of love, of course, has rules, and they may seem harsh, inflexible and distinctly unloving to the (post)modern mind. For David Cameron, rule-governed love is restrictive: the love of God transcends the fetters of man. The concern is with the oppressed, the exploited, the lonely, sick and dying. Christians have a responsibility to act justly and righteously: the God of the prophets is a practical God who cares about the poor, afflicted and vulnerable. But there is a slight niggle..